Pakistan's Supreme Court on Wednesday overturned the conviction of a Christian woman sentenced to death for blasphemy against Islam's Prophet, ordering her to be freed if she was not accused of any other crime. Chief Justice Saqib Nisar overturned the conviction by the Lahore High Court that had sentenced Asia Bibi, a mother of four, to death in 2010. She has been held at an undisclosed location for security reasons and is expected to leave the country. "I am very happy. My children are very happy. We are grateful to God. We are grateful to the judges for giving us justice. We knew that she is innocent," said Ashiq Masih. A hardline Islamist party called for the death of the chief justice of the Supreme Court and two other judges who overturned Bibi's death sentence. The leader of the Tehreek-e-Labaik (TLP) party also called for the ouster of Prime Minister Imran Khan's government over the case. "The patron in chief of TLP, Muhammad Afzal Qadri, has issued the edict that says the chief justice and all those who ordered the release of Asia deserve death," said party spokesperson Ejaz Ashrafi. The charges against Bibi date back to a hot day in 2009 when she went to get water for her and her fellow farm workers. Two Muslim women refused to drink from a container used by a Christian. A few days later, a mob accused her of blasphemy. She was convicted and sentenced to death. The mere rumour of blasphemy can ignite mob violence and lynchings in Pakistan, and combatting alleged blasphemy has become a central rallying cry for hardline Islamists. Salman Taseer, the governor of Punjab province, was shot and killed by one of his guards in 2011 for defending Bibi and criticizing the misuse of the blasphemy law. The assassin, Mumtaz Qadri, has been celebrated as a martyr by hardliners since he was hanged for the killing, with millions visiting a shrine set up for him near Islamabad. Ahead of the verdict, Khadim Hussain Rizvi, a hardline cleric who has brought tens of thousands of people into the streets for past rallies, called on his supporters to gather in all major cities to express their love for the Prophet and to protest if Bibi is released. Authorities have stepped up security at churches around the country. Shortly after the ruling, hundreds of Islamists blocked a key road linking the city of Rawalpindi with the capital, Islamabad. Islamists in Pakistan's largest city of Karachi and in the northwestern city of Peshawar were also gathering for the protests. Similar rallies were held elsewhere. Police urged demonstrators to disperse peacefully. In the eastern city of Multan, police arrested several demonstrators after clashes. Paramilitary troops deployed in Islamabad to prevent protesters from reaching the Supreme Court, where security for the judges was being beefed up. Bibi's family and her lawyer say she never insulted the Prophet. In previous hearings her attorney, Saiful Malook, pointed to contradictions in testimony from witnesses. The two Muslim women who pressed charges against Bibi denied they quarrelled with her, saying her outbursts against Islam were unprovoked. Chaudhry Ghulam Mustafa, a lawyer for one of the plaintiffs, rejected the verdict, saying Bibi had confessed to making derogatory remarks against the Prophet to seek pardon. The three-judge panel upheld the blasphemy law itself, saying it was consistent with verses from Islam's holy book, the Qur'an. But they said prosecutors had failed to prove that Bibi violated the law. In addition to citing the Qur'an, the judges also referenced Shakespeare's King Lear, saying Bibi was "more sinned against than sinning." 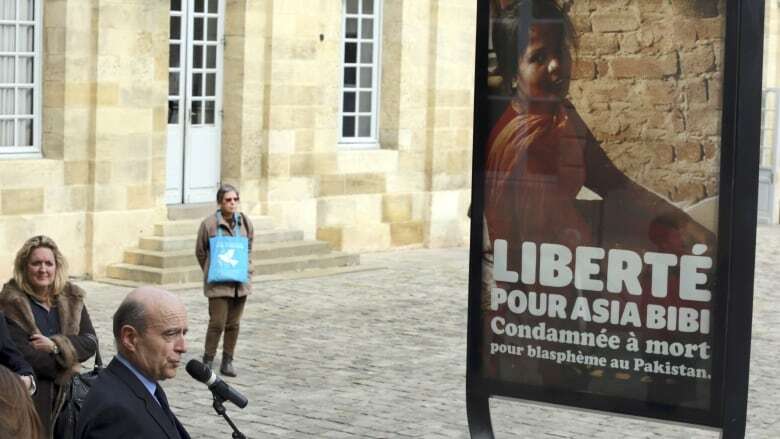 Critics of the blasphemy law have said it is used to settle personal scores or to attack minority communities. Bibi's case was closely followed internationally amid concern for Pakistan's religious minorities, who have frequently come under attack by extremists in recent years.